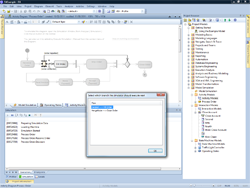 Enterprise Architect 9.1 introduces Dynamic UML Model Simulation, with support for automated and intelligent execution. Intelligent simulation can help you to reduce risk and determine the impact of designs before committing resources. Manipulate Control Flow at Breakpoints to help eliminate bottlenecks and identify the optimal path in a simulated environment. 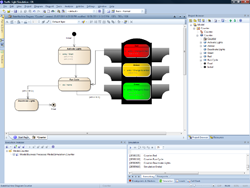 Debug and manipulate control flow during a blocked simulation using the console window and breakpoints. Significantly extend the reach of simulations by allowing COM based interaction with external systems. MDG technology for ArcGIS now includes detailed support for configuring Spatial Reference information. Visualize cause and effect relationships as your business rapidly assimilates new processes. Test different scenarios to help identify the optimal path, using Breakpoints and the Console to interact with your simulation. Create and call COM objects during guards and effects, to significantly extend the reach of your simulations. Control the execution speed of the simulation to ensure you witness important events and better understand your simulation. Enterprise Architect supports the design of geodatabases for the ArcGIS 10.0 suite of tools developed by Esri Inc. Simply drag and drop ArcGIS feature types onto a diagram and visually connect these elements, just as you would for a UML Class diagram. Then leverage Enterprise Architect's built-in schema generator to create an ArcGIS workspace from your model.